Since this band was one of the pioneers of the Norwegian black metal scene so it seems appropriate that they continue to blaze new trails. 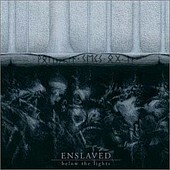 "Below the Lights" accomplishes was so many black metal records can't? it expands the boundaries and limitations of the genre without jeopardizing the metallic core of the scene. Haunting soundscapes, over-indulgent melodies and experimental embellishment abound on this CD but at the heart of almost everything are shredding guitars, driving rhythms and deranged vokills. In and of itself the musical expressions on the album aren't necessarily groundbreaking (its often reminiscent of what bands like JETHRO TULL or even YES used to do-although certainly heavier) but in the context of extreme metal it's tantamount to the same thing.